Kalahari Hunting News, Issue #9 -- Contest Results and More Hunting! Contest Results and More Hunting! 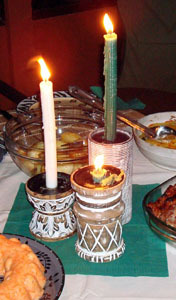 If you can not see the pictures included in this mail, you can view this Newsletter on the Web. Just click on this link! African Hunting Story Contest: Results! Picture top right: Michael with "Mrs. 5'" from Florida, USA. Thanks, Melissa, for being so much fun! 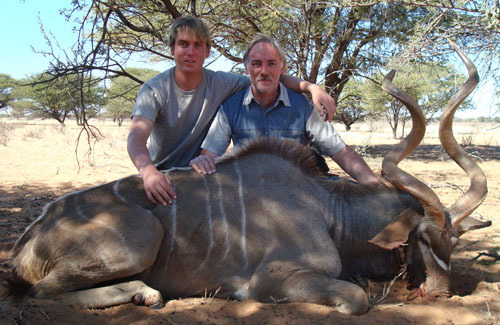 Scroll down to read more about this group's Kalahari hunt. African Hunting Story Contest... RESULTS! As most of our subscribers will know by this time... we launched an "African Hunting Story Contest" on our website. The closing date for stories to be entered for the competition was June, 30th. You can imagine how exciting and interesting it was for me to receive every new story as it was submitted to our site by the authors! It was an honor and I want to thank everyone who took the time to contribute his/her hunting story and thus join our "online-campfire-community". Below you will find Roger's comments on some questions we asked him. It includes his first memories of hunting and thoughts on hunting in Africa. The new free Kalahari Wallpaper for you this month, is a picture of the Greater Southern Kudu - here in the wintry landscape of the Kalahari. "We don't really think of how animals keep cool during the warm summer days in the desert. 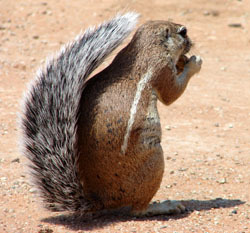 Here is how the squirrel do it: he uses his own tail! When it's so hot, he spreads out his wide, bushy tail. And that is an ideal umbrella for the desert. 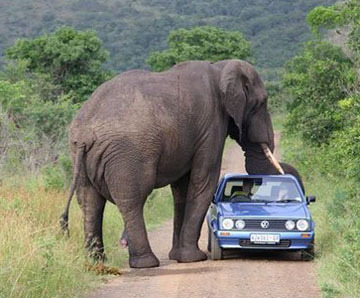 This way he can forage longer than other animals!" We had so many beautiful hunting pictures to publish in our previous newsletter, that we could not include those of Chris Widger (USA). Chris came to Uitspan Ranch with our friend Kobus of Africa Thirstland Safaris. 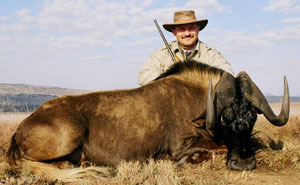 During his few days in the Kalahari, Chris hunted an Eland, Impala, Gemsbok, Kudu... and also ended up with a Brown Hyena. This Hyena entered the adjacent ranch of Casper Steenkamp and he invited Chris and us to join the hunt. Brown Hyenas are very common in the Kalahari and sometimes they cause huge losses in herds and then have to be hunted down. 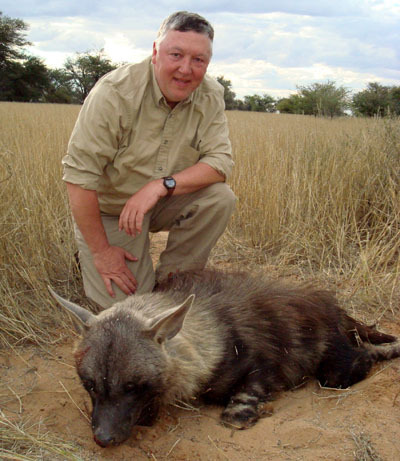 It is illegal to import Brown Hyenas to USA, but Chris still enjoyed the hunting experience. Chris was followed by two couples from Florida, USA. 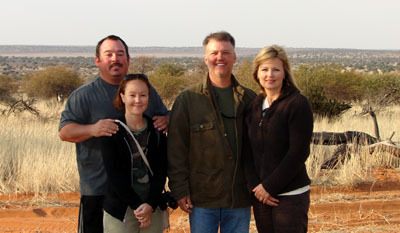 Brooks & Susan Rollings and TW & Melissa Thomas are friends and came together on their African safari. Michael had a great time teasing Melissa about her length and renamed her "Mrs. Five Foot". You know...Michael thought there is nowhere else in the world a shorter woman than his wife ;o))! 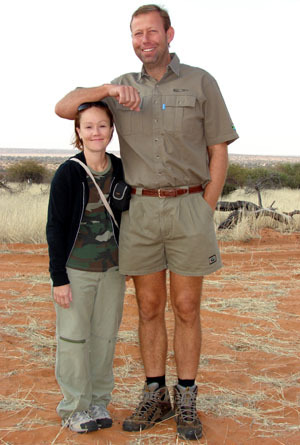 Above: TW and Melissa with the Kalahari Gemsbok he took. Melissa is also a hunter and indicated that she may not stand back on hunting opportunities on their next trip to Africa. Watch out, TW! 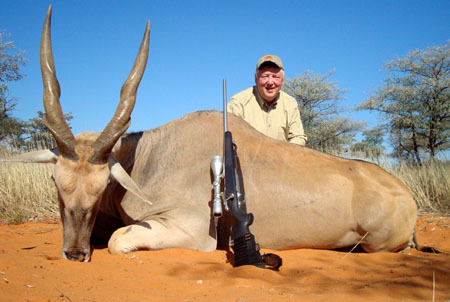 Below: Brooks took a very nice Kudu. We had a great time with these four friends and we will always remember our enjoyable and lengthy campfire-discussions. Prost... to new friendships! Then there were... Anton, Hennie and their friends and families from South Africa. 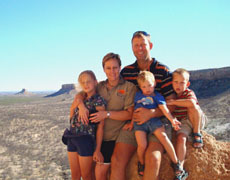 ... add and you get a group of 4 couples and their grown-up children - all coming to Uitspan in the Kalahari to relax, hunt and enjoy nature. 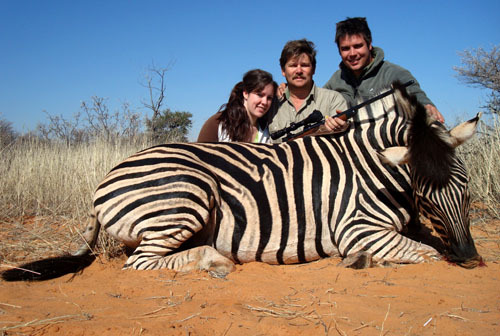 Above: Lourens took this Zebra on Uitspan and was joined by his daughter Amy and son Manie. 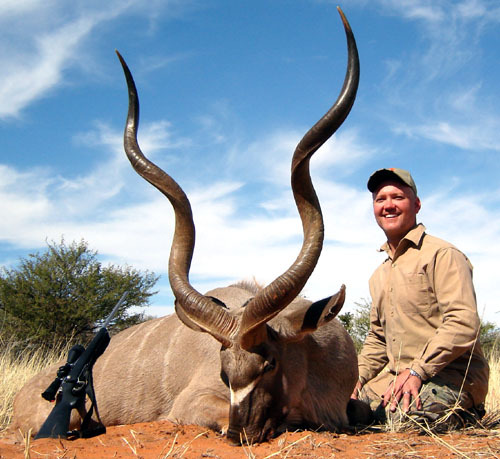 Above: Anton hunted this Kudu Bull with its deformed horns for meat. We'll publish more pictures of this group in our next issue. The Caracal: A Video about the "Superstar of the Animal World"
Farmers living next to the Botswana border (where Uitspan Ranch is also located) live through a lot of encounters with predators. Many hunts are shared. Many stories and experiences are told. Tricks, tips and plans for every situation, predator and circumstance are handed over in the generations of these ranchers. However, once in a while a certain predator outwit every trick and plan of a ranch-owner and causes unbelievable losses in sheep- or cattle-herds. 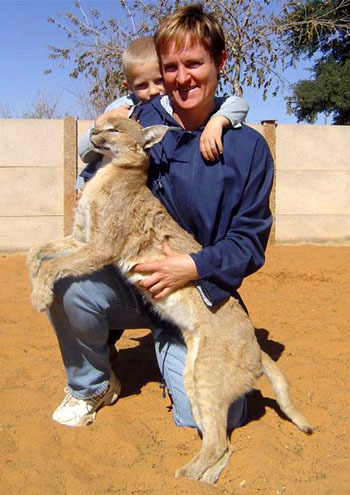 In November 2006, Awie and Sonja Steenkamp (living on a ranch ± 35km north of Uitspan) became aware that a certain caracal (known by its specific track) is often entering the ranch, killing their sheep. Caracals are regarded as a serious threat to livestock. Awie and Sonja started by putting out traps. After this they used bigger traps with bait, but the cat never even came near any kind of trap. It had supernatural instincts and this became clearer as time went by. During the following months, Awie and Sonja often send their expert trackers to follow the spoor of this cat from a killing. The trackers also used their experienced dogs, but the caracal walked so many miles every night, that the dogs could never follow the scent. Another problem was that the tracks always went to a certain pan located a few kilometers from there. It is impossible to follow such tracks through a pan here in the Kalahari (see a picture of these pans on our Kalahari Desert-page. What made it even more difficult to find this "killing-machine" (which by now killed many lambs and grown-up ewes), was the fact that its ways of entering, its hunting times, its regularity of killing, etc. were all absolutely unpredictable. Their luck changed when they got hold of certain "poison-collars" from a manufacturer in South Africa. This patent is registered in South Africa and legal for use in circumstances like these. These collars are put on sheep and contain small packets of lethal poison for predators. When a predator then bites the neck of such a sheep, it also bites the poison-sacket and the problem animal is successfully taken out. This Caracal took TWO ewes with these collars before he died. Imagine the utter relief when the cat was found! 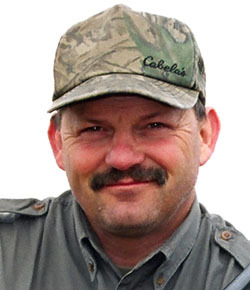 As mentioned above, Roger win our Hunting Story contest. We mailed him some questions. Here are his comments. I was born in Spokane, Washington, USA, and have lived here all my life. What are your first memories of hunting? Two of my uncles introduced me to hunting when I was 13 years old. They took me Whitetail Deer hunting, and that first year I did not carry a rifle. My late Uncle Ivan in particular was my mentor, and he kept me by his side and taught me the techniques of hunting, how to identify sign, hunting safety, marksmanship, and he familiarized me with the hunting area, etc. More importantly, he introduced me to the wonderful sport of hunting which in turn has developed into a lifelong passion for wildlife and the great outdoors. His inspiration and guidance has been the cornerstone of my obsession and of my life. He died suddenly and tragically this past year, and every day I think of him, and this gift he has instilled in me. What are your reasons for hunting? What inspired you to take part in our contest? That is a very interesting question. I found your web-site quite by accident. As I alluded to in my story, my first and only trip to Africa was a gift to myself in celebration of my 50th birthday. As I am now a few years away from celebrating my 60th, I thought I would begin checking out my options for another special event. Obviously, a return trip to Africa was at the top of my wish list, so I guess fate brought us together. As I began researching your site, I noticed that you were conducting a contest. I've entered many contests over the years, but when I checked the criteria for yours, I immediately thought to myself "now here's a contest I actually have a chance of winning!". I had been to Africa, so I had the proper subject matter. My trip was the experience of a lifetime, so I had a story to share. And finally, I enjoy writing and have been told I have a knack for it. So it only seemed natural that I should enter. In fact, as you know I actually entered two stories. I really wanted to win this contest! Can you tell us what your single most special and distinctive memory is of your first time in Africa? Again, this is a very difficult question as there were so many special moments, and I remember it is if it happened yesterday (and at my age, that is really something!). Obviously there was the anticipation, excitement, nervousness and all the other emotions you feel as you plan the trip of a lifetime to a far away land. The back and forth communication, the preparation and planning, it was a very exciting time. However, once the trip actually took place, I guess there are really "two" distinct memories that stand out. The first would be the wonderful people I had the privilege to meet. They were some of the kindest, friendliest people I have ever met. They went out of their way to insure that I not only had a successful hunt, but that this birthday would be one never to be forgotten. In every way, they were 100% successful. And of course, the hunt itself was unforgettable as well. I was completely enthralled by all these magnificent and wonderful animals. In all, I took 7 plainsgame animals, 6 of which made the SCI record book with 4 gold's and 2 silver's! Absolutely amazing and beautiful creatures! Oh yes, and I can't forget the sundowners! I have to add the sundowners to my list. The most beautiful sunsets in the world, in one of the most pristine environments on earth, and sharing the experience with new found friends. It simply doesn't get any better than that! You'll see that our packages are really unbeatable. We made it available for booking until September 1st, 2008. After that, we'll have no choice but to adjust the prices. Here are links to the hunting stories which the judges put in the first 12 places. Make sure to read them.... it is as good as going on a safari yourself! There are times when a child of God is upon the mountain top of faith. There are also times when weakness of faith manifests itself. These two are in our lives because we still have the old man of sin until the day of our death. The new man in Christ will reveal himself; but the old man of sin will also at times be in control of our thinking, willing, and doing. When David cried out in Psalm 27, "Whom shall I fear? Of whom shall I be afraid?" he was on the mountain top of faith. But weakness of faith revealed itself when he stated in verses 7, 8, "Hear, O Lord, when I cry with my voice: have mercy upon me, and answer me. When Thou saidst, Seek ye My face, my heart said unto Thee, Thy face, Lord, will I seek." Here David still reveals faith in God. But he is not revealing the confidence he expressed in verse 1 of this psalm. Now he is crying for help and voicing a measure of fear. Nevertheless there is an important truth here, namely, what David had stated in verse 5 in these words: "In time of trouble He shall hide me in His pavilion: in the secret of His tabernacle shall He hide me." No, he was not now on the mountain top of faith; but he does still reveal faith in God. For he prays to God, seeks His mercy, and expresses a desire to seek God's face. When Satan sent powerful waves in an attempt to wash him away into unbelief, he did not succeed. God was David's and is our light and salvation. In His unfailing grace and mercy God will keep us from losing our faith. Once engrafted into Christ by faith, we will never be plucked out and be cast into unbelief. As for our salvation which is in Christ, God will keep us safe from falling away into unbelief and everlasting punishment. We do not need to be afraid that God will change and cast us into darkness. ..."The hindering of good work is that which bad men aim at and promise themselves; but good work is God’s work, and it shall prosper." was the conversation in this vehicle?